Welcome to the Mabel Express Sewalong! 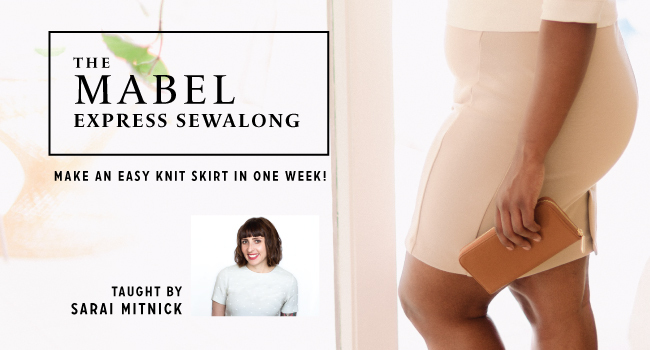 In this sewalong, we’ll be spending just one week sewing through each step to create your very own Mabel knit skirt. Whether you’re making a mini skirt (version 1), button skirt (version 2), or pencil skirt with kick pleat (version 3), we’ll have you covered. If this is your first time sewing with knits, you’re in luck. Mabel is the perfect starter project, simple to make and extremely useful in your wardrobe. I’m Sarai, founder of Colette Patterns, publisher of the Mabel pattern and The Colette Guide to Sewing Knits. We created the Mabel pattern with designer Alyson Clair, whose expertise in knitwear design will help inform the techniques you’ll learn in this sewalong. Our sewalongs are simple. We’ll publish a series of posts detailing each step in the process of fitting and sewing your Mabel skirt. You can sew along with us, ask questions, and share your techniques and advice with others. Today, we’re introducing the sewalong. Tomorrow, we’ll cover the fabric and supplies you’ll need to make your skirt. After that, you’ll have some time to buy your pattern and any other supplies you might need, if you haven’t already. On Monday, we’ll talk in a little more detail about sewing with knits, and what to do if you don’t have a serger. We’ll be back June 2 to start walking through the sewing step-by-step. From this point, the whole thing will be done in one week. You can sew a little each day, or follow along with the steps and make your skirt over the weekend. I bought the Colette book of Sewing with Knits, which came with the Mabel pattern. I’m READY! for this, my first,too, sew along! Also, I can’t wait for the Moneta sewalong to start! Just bought my pattern from Sew Squirrel- can’t wait for it to arrive! It’s been a long time since I’ve sewn with knits, so I’m very interested to see how/if techniques have changed. I’m so (sew) excited. I’ve been hemming and hawing over this pattern because almost all skirts don’t flatter my figure and this email pops up! It was the push I needed. This is my first sewalong and my first dive into participating in an online community activity. I may even join facebook again! Thank You! This is my first sewalong and I am truly looking forward to this skirt. I can’t wait. Thank you. I am so happy to see stylish patterns for plus sizes. I love the models you chose, too. They really show the diversity of bodies this pattern will flatter. I can’t wait to get started! I’m just waiting for my fabric. Got started a bit late on taking the plunge into my first sew along! Do you ever suggest to trace a pattern so you can use other sizes and not waste the whole pattern by cutting it out?